It was a phrase of David’s that had entered the family vocabulary and Riley said it cheerfully, climbing the fence to reach the stirrup of Petra, one of the three huge clysdale horses they kept, who were by far the best choice to ride when the snow was this deep. 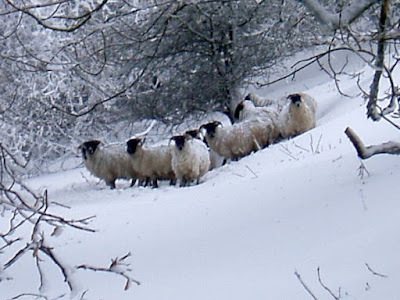 They waded more easily, their bigger bulk kept them warmer, and their big, solid and woolly legs, well wrapped against the snow crusts, took no harm as they padded through the pastures. Most of the sheep had retreated to the woods where the snow was far less and the trees acted as a wind break. There were shelters scattered throughout it and every time they checked a shelter it was crowded with a bunch of sheep, laying down in a tight huddle together, generating warmth you could feel coming out of the entrance, and who looked at you with a what? expression when you put your head in the door. A few more sheep were grazing on the pathways which again had escaped the worst of the snow, pawing aside snow to reach the frozen grass. They were hauling hay and leaving deposits of feed at intervals, having set up feeding stations as soon as the snowy weather started in November. Dale, shifting his weight to let Boris navigate a steep slope where snow had drifted, spared Riley an exasperated look. Dale put a hand up to shake the bough above his head, which showered snow over Riley and made him laugh, but had little other effect. It took several slow hours at the moment to replenish the feeding stations, to check the shelters and look out for an injured or sick animal, and for the dogs to comb through the woods as they did daily, partly for sheep and partly because the dogs would recognise it immediately if wolves were hunting near here. By noon, they were both cold despite the work, and despite being well wrapped up. He took his glove off to lean forward and feel Petra’s ears, then rubbed them to get some warmth back into them. The clysdales had blankets on under their saddles, and Boris was warm as Dale ran a hand under his blanket, but his ears were icy, and he was fidgety, obviously keen to move. Dale scaled him to reach his saddle and Boris gladly turned to pace after Petra, through the mulch and dust of snow to the path on slightly higher ground that Dale thought had probably once been one of the main thoroughfares for Three Traders. The wagon trains had somehow rumbled through this wood and in places the wide paths were still there, the earth beaten so flat by the wagons passing that it still bore the shape. The trees were thick on either side, sheltering it, and the snow was only a couple of inches deep there. The horses, skidding slightly down the bank to reach it, stepped out in relief as they were able to walk instead of wade, and Dale followed Riley’s example in nudging Boris to a brisk trot for a few minutes, their feet heavy on the ground. It put them both out of breath, but the horses were warmer when they slowed, reaching the first of the gentle slopes that led downward onto the ranch pastures. It was there that Dale first saw him. Boris walked briskly past, not quite trotting but not far off, and it was the flash of coat and scarf that caught Dale’s eye. A man. A man with a shaggy beard, under a large brimmed hat, wrapped in some kind of shawl tied on over his coat, and heavy boots, just standing between the trees at the side of the path and looking at him. His expression was fixed. Dale drew in Boris cautiously, not wanting to make him slip, and turned back in the saddle to look. There was nothing and no one between the trees now. “What?” Riley called back, turning Petra. Dale looked for a moment more. There was nothing. And he felt nothing. Not the dragging pull, the anxiety or the dread he could usually feel when he saw this kind of thing, which usually meant he needed a closer look. Nothing at all. “I think he was a visitor, not someone stuck.” Dale let Boris carry on and Petra kept pace with him. Riley, who’d learned the differences as Dale learned them and learned how to explain them, nodded comprehension. There was a difference between them. The visitors occasionally wanted more than to just say hello, but mostly they were minding their own business and doing what they wanted to do, coming back to places they had loved. The stuck ones were a good deal darker and they were the ones that often came with the swells of negative emotion, looped in a moment of time they couldn’t move past. The stuck ones were far, far rarer than the visitors, and the couple Dale had seen David ‘unstick’ had made a far stronger impression for the associations they gave him. The annual Christmas shopping trip to Cheyenne had taken place, and in the evenings, Dale helped Jasper to wrap gifts and label them, the two of them being the ones best with their fingers in wrapping complicated shapes. Paul had written Christmas cards by the dozen and sent them out from Jackson at the very beginning of December as it wasn’t unknown for the road through to Jackson to become a good deal harder to travel as the snows fell. A few decorations had gone up in the family room already as Paul and Riley loved to decorate, but the tree would not be brought home until the last few days before Christmas. Bear and Theo, Gerry and Ash, and Luath and Darcy had plans to arrive on the 23rd and 24th. Dale had arranged a conference call between Niall and James, Wade, Luath and themselves, and they had spent an evening in the study joining in a multiple way conversation for very unbusinesslike purposes and enjoying it in ways Dale had never before enjoyed conference calling. When he wasn’t helping with the cattle, who had been brought in close to the house to make it easier to feed them and keep them sheltered from the snow, which currently included one of them going out at midnight and again at 4am to keep drinkable fresh water available to the stock as any water you left standing, froze solid, Paul was stocking the freezer with what he thought of as ‘proper’ food for a family party this big. Eating turkey at Thanksgiving instead of Christmas was still a new experience for Dale. “Yes, that saves you having to do any thinking or feeling, doesn’t it? We don’t ‘just get on with things’ here.” Paul said darkly. Dale smiled at his expression, ducking the mock cuff Paul aimed at his head. He and Riley showered as soon as they got in, mostly to warm up. They were working flat out at the moment from as soon as it got light, to mid afternoon when the sun began to fade and the temperature to plummet. They went out again through the evening to the cattle and to the corral horses, but Paul served what he called high tea around 4pm which was a light, but hot meal and made up for lunch which they usually ate while they were working and which was cold despite the thermoses of hot tea and cocoa. The fire in the family room was lit all the time now, an essential part of the house heating, and late afternoon after they’d showered and eaten, they gathered in the family room for the much longer evenings of winter, which was something Dale loved. “You are twitchy, what are you doing with the apples?” Riley demanded this afternoon, as having eaten cheese on toast with one of Paul’s own stick-to-your-ribs soups, they settled in front of the fire. Dale took his hand off the basket of red apples that was currently gracing the coffee table, and realised he’d been turning them all to face the same way. Flynn, in the process of helping Riley set out one of their more complicated board games, as they would have plenty of time to play it, held out a hand to Dale and Dale growled but got up and went to Flynn, letting Flynn lift his chin without the faintest idea of what he was looking for. Whatever it was, he let Dale’s chin go and pointed at the hearthrug at his feet. “Another murder mystery?” Jasper, who had just made another brief foray to check on the frozen state of the water outside, rubbed his hands together as he sat down, and slid one down Riley’s back, making him squirm and yell. An exaggeration and Dale gave him a smile, knowing Riley meant was it was one of the games he really enjoyed for the challenge. In Cheyenne on their shopping trip this year, Flynn had taken all five of them to a store and they’d updated their range of games, choosing them together, and Dale had enjoyed the mix – the serious intellectual challenge games, but actually the simple, fun and interactive ones too. Paul had been particularly good at picking the simplest and silliest things that were the most fun to do together and didn’t require much attention at all. They played for some time, Dale and Riley stretching out on the hearthrug and Jasper sitting between them. Flynn leaning down from his armchair and Paul, disappearing into the kitchen at intervals to check the pastries in the oven, sat on the arm of Flynn’s chair and watched over Flynn’s shoulder. Dale, coming into the kitchen to make tea while Paul took the current batch of pastries out of the oven, found himself humming something and Paul looked up at him. “I haven’t been able to get it out of my head all afternoon.” Dale lifted cups down from the cupboard, arranging them on a tray. “It’s the end of a song I used to know, a toast that ended in three cheers; hats full, caps full, three bushel bags full and little ‘eaps under the stairs....” he said it with the Somerset accent he remembered hearing it in, and Paul smiled. “I’m not sure I know the link between apples and Christmas?” Paul said with interest. Dale shrugged, getting milk from the fridge. Aware he was chattering, and slightly annoyed with himself, Dale took a breath and Paul held onto his hand. It was a serious question, and brushing it off would not go well. Dale searched himself and shook his head, frustrated. No one said anything else, but Flynn clicked his fingers when Dale brought the tray in, holding out a hand, and Dale settled on the floor at his feet with his back against Flynn’s legs. They played on with the game for a while until Riley leaned over in exasperation and took the apple bowl, moving it out of Dale’s reach. There was genuine concern as well as teasing, and Dale gave him an apologetic look, aware why Riley didn’t like these warning signs any more than he did. “What are you thinking about?” Flynn put a hand down to turn his chin and Dale looked up at him, resting his head against Flynn’s knee. There was no point in explaining that the game was not yet finished, nor that fiddling with apples was not an indicator of advanced neurosis. Resigned, Dale got up and Paul waited at the foot of the stairs, hand still out. He meant it. Dale, going to him, glanced at the window by the study as he reached the foot of the stairs, and froze with a very sharp jolt to his stomach. A thump of pure ice. The trapper, or whatever he was, was standing in the yard. Hands in his pockets, his eyes on the house, unmoving. “What?” Paul said, startled, and Dale spared him a brief glance, heading towards the kitchen with a cold feeling growing down his spine. They never came to the house. Never. He’d never seen one this close to home except David. He reached the kitchen and stood behind the closed door, looking out through the glass. The man met his eyes squarely. Face expressionless, he just stood in the yard, looking at the house. Jasper came to join him and Dale glanced back at him, aware his voice sounded detached. Jasper put a hand on his shoulder and gripped it calmingly. The protection was almost instantaneous these days: Dale did it automatically; not white light for him, but always golden yellow, but just thinking consciously about it made him feel calmer. The man was still there. I do not want it to come into the house. Jasper stooped to get his own boots, lifting two jackets down from the hooks, and Dale led the way out onto the porch, his stomach getting tighter. The man went on staring, standing still, hands deep in his pockets, with the faint oddness of light at the edge of his clothes like something just slightly out of kilter with what was around him. Jasper followed, shutting the kitchen door behind them, and his boots crunched as he stepped down into the snow. And then just like that, the man winked out like a candle blown out in the dark, and there was nothing there. A hot bath – Paul had a thing about deep, hot baths for people supposedly stressed- and an early night, did not automatically equal sleep. Flynn came up a little before ten. He and Jasper were both going to bed earlier than usual with their taking it in turns to get up through the night, and while Paul and Dale and Riley took their turns and did their best to equalise it, Flynn and Jasper still quietly managed to do the lions share. Flynn moved quietly as though prepared for Dale to be asleep, and at the sight of Dale’s open eyes, closed the door softly and sat down on the edge of the bed, giving him a straight look that made Dale’s stomach drop in a very different way to the man outside in the snow. No, we really, definitely don’t thank you, was Dale first and fervent response, knowing very well what Flynn meant, and ‘talk’ was a definite euphemism for it, but somehow it didn’t actually get out of his mouth. Flynn waited for a minute to be sure he wasn’t going to answer, then held out a hand to him. Aden, you’re a blithering idiot! Dale got up and came around the bed to him, and Flynn took his arm, drawing him firmly and inarguably across his knee. Dale found himself folding his arms against the bedclothes, a very definitely resistant gesture which surprised him. He made himself unfold his arms and swallowed as Flynn matter of factly lowered his shorts, laying a warm palm across his bare backside to rest there, not threatening but extremely focusing. It was as acute as Flynn’s arm firmly across the small of his back, which made it very clear he’d better get his head together and start thinking. “What have you been laying up here thinking about?” Flynn asked in the same matter of fact tone. Dale tried not to too obviously shift his weight across his lap in futile attempt to get into a less vulnerable position. The obsessing ones that went round and round and were usually a warning sign of stress building up. Dale thought about it and winced. The swat he got for that was sharp, made him yelp and left a stinging handprint on one cheek. He yelped and twisted much more vigorously at the half dozen hard swats Flynn dealt him, three squarely to each side, leaving him breathless. Flynn did not sound amused. Damn. That was brutally efficient; there was little way to argue with it. “You’re clear, sir.” Dale said quickly. Flynn wasted no more time. Usually one of these kind of discussions involved a fairly mild few swats; it was often more a means of focusing Dale’s attention and ensuring an open conversation more than to make a real impression, but tonight Flynn gave him a very brisk dozen more swats that made him squirm without being able to help it, and yelp a lot more than was dignified. Pushed further and more firmly than he’d expected, he was very out of breath when Flynn stood him up, nodding towards the corner by the window. Dale re ordered his shorts and took up the assigned position in the corner, elbows brushing the wall, backside smarting sharply enough to keep his mind of anything much but how it felt, and the whole plan of communication very firmly at the front of his mind. Flynn had a way of clarifying things that went through any doubts you happened to be harbouring like a dose of salts. Unable to resist briefly rubbing at his rear which was now hot and tingling more than actively uncomfortable, Dale crossed the floor and slid under the covers. Flynn, sitting on the side of the bed, held out a hand and Dale saw that he was holding the small night stand clock. Slightly embarrassed and in other ways actually quite relieved, Dale unstrapped and surrendered the watch, and lay down as Flynn took them out of the room. The song ran through his head at maniac speed, and Dale turned over onto his back, concentrating on shutting it up. Flynn came back, turned the light out and lay down beside him, lifting an arm for Dale to slide over against him and holding him tight, his body warm and hard and familiar against the whole length of Dale’s. Dale turned his head to find his mouth and kiss him and lay down against him, determined that he could successfully forget about apples. “It’s what?” Flynn sounded sleepy and Dale woke up, realising he’d said aloud what he’d been dreaming, repetitively for what felt like hours, over and over again and getting increasingly frustrated. “What do you think?” Flynn leaned over and turned the light on, giving him a look so quizzical that Dale realised Flynn wasn’t convinced he was actually awake. Dale put an apologetic hand on his knee and slid past him to get to the window. The old man was standing in the snow, now just beyond the vegetable patch, looking directly up at him, his face still expressionless. “He wants to what?” Riley watched Dale rinse out a small wooden bowl that was usually used to store the keys to the various sheds in the yard and dry it. On the table stood one of the Three Traders bottles of moonshine, and Paul, taking pasties out of the oven and wrapping them, added them to a saddle bag. Where else in the world could you say this kind of thing to and be not only listened to but believed, and have them agree, at a little past seven in the morning, to ride out to the edge of the woods and go wassailing? They took the clysdales along with Nekkid and Hammer, who were the biggest and tallest of the corral horses, and crossed the pasture together, heading for the edge of Freeman’s Field, just where the tree line began of the woods. The men was on the edge of the field, just under the first trees, hands in his pockets, face still expressionless, and Jasper raised his eyebrows slightly, then glanced across at Dale. There were times, especially when they were together, that Jasper caught glimpses of whatever or whoever these whats were, and it was usually when they were at their strongest. Which was a good sign they were on the right track. Dale led Hammer a little in front of the others, guiding him towards that spot under the trees, and dismounted there, taking the wooden bowl from his saddle bag. Paul dismounted and took the bottle of moonshine, handing it to Jasper to open, and they gathered in a circle around the bowl. Dale took out his now very rarely used Blackberry, removed from the safe this morning with Flynn’s permission, and located the song he had downloaded that morning, and a piece of toasted bread, and Jasper, having prised the stopper from the moonshine, poured a little over the toast as Dale held it out to him. “Where?” Flynn asked, and Dale indicated the nearest tree to the woods the sheep sheltered in. Flynn walked with him to the trunk of the nearest climbable tree, and put a hand out to stop Dale making the attempt to climb. Instead he simply hooked an arm around Dale just below his hips and straightened up, hoisting Dale high enough to reach the branches. Startled, Dale grabbed him for support with one hand, but placed the soaked toast up in fork nearest the trunk. Flynn steadied him until he let it go, then slid him back down to the snow without effort. Breathless, and in rather a good way, Dale walked with him back to the other three, and watched Paul pour the moonshine into the wooden bowl. Then he looked at Dale, waiting, and Dale pressed play on the file on his Blackberry. The carol was an old one sung by a modern band, and birds burst up out of the trees in astonishment. Riley caught Dale’s eye and grinned at the English voices and the heavy guitars singing a song about apples that was hundreds of years old, and Dale, taking the little bowl in both hands, took a sip from it and passed it to the left, to Riley, who followed his example and drank before he passed it on to Paul. The five of them, stood in a circle in the snow, shared the fiery liquor between them while the carol played, and when it ended, Dale took the dregs in the bowl and poured it over the roots of the tree. Riley gave him another you extremely strange man look, but there was affection in his grin. Perhaps twenty yards away from them on the bank, the man in the tied on shawl and overcoat abruptly smiled, and then just as suddenly he was gone. It was fairly typical; Dale was coming to know it well. They came and they went to their own priorities, and rarely said thank you, but the peace they left behind had nothing to do with them just being gone. Shaking off the bowl, Dale returned it to his saddle bag and accepted one of the still hot lamb pasties from Paul. “In thirty below no thank you, let’s get going.” Flynn, brushing his crumbs off his hands, mounted Petra and leaned down to give Riley a hand to scale Boris. Paul, mounting Nekkid, gave the toast in the tree another interested look and smiled at Dale. “They’re going to think I’m insane.” Dale said ruefully. Riley grinned at him, drawing Boris alongside Hammer to pat his arm.